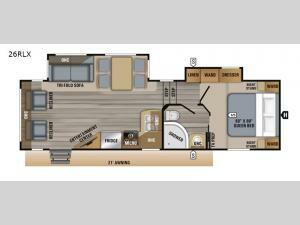 Take your medium sized family on weekend getaway with this Jayco Eagle HTX 26RLX fifth wheel. It features plenty of seating in the rear living area between the tri-fold sofa and two recliner chairs, plus the free standing dinette where you can enjoy your delicious meals at! For your convenience, there is a front private bedroom that has a queen bed with night stands on either side, plus an entrance into the dual entry bath. You can enjoy the great outdoors at anytime when you grab a chair and your favorite beverage and head underneath the 21' electric awning with integrated LED lights!